NASA’s New Horizons spacecraft is on a mission to collect data and images of the dwarf planet Pluto, its surrounding moons and other objects in the Kuiper Belt. An earlier mission, named the Pluto Kuiper Express, was cancelled by NASA in 2000 due to funding issues, yet six years later the New Horizons mission was launched. For all its scientific objectives to be accomplished the New Horizons spacecraft must pass through a circular region of space just 300 kilometres in diameter. On February 28, 2007 New Horizons took advantage of Jupiter’s gravity to increase its speed by 4 kilometres a second. This manoeuvre is known as a gravity assist. When the New Horizons mission was launched in 2006, Pluto was still classified as a planet. In August the same year it was reclassified as a dwarf planet by the International Astronomical Union because it failed to meet one of three requirements necessary for being classed as a planet. At closest point on the 14th of July the spacecraft will be within 9,650 kilometres of Pluto’s centre of mass. New Horizons is the fastest spacecraft launched, leaving the Earth with a speed of around 16.26 kilometres a second. Only four other spacecraft have travelled as far away from Earth as New Horizons, they are Pioneer 10, Pioneer 11, Voyager 1 and Voyager 2. While in the vicinity of Pluto it takes around 4 and a half hours for a radio signal from New Horizons to reach Earth. On passing Pluto the New Horizons spacecraft will have travelled 4.76 billion kilometres, the equivalent of 32 trips between the Earth and the Sun. The spacecraft itself holds seven scientific instruments to capture and record data about Pluto, including information about its surface, atmosphere and interior. The instruments carried by New Horizons include Ralph, which will help provide thermal maps of the dwarf planet, Alice, which is an ultraviolet imaging spectrometer and will analyse the atmosphere around Pluto and its moons and LORRI (LOng Range Reconnaissance Imager) which is a powerful telescopic camera that can obtain images and data from great distances. 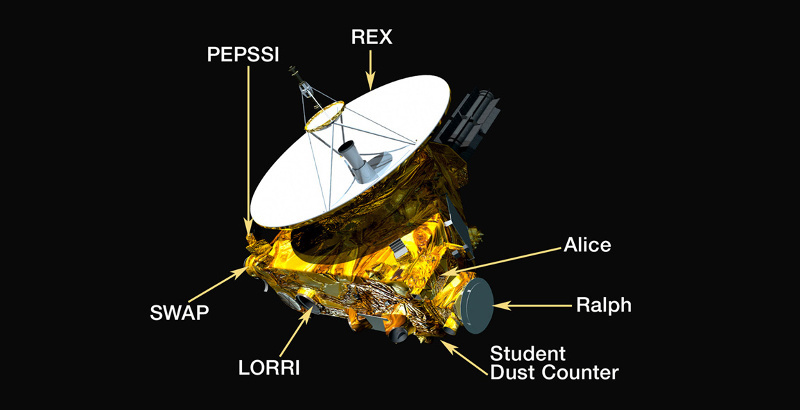 As well as the scientific equipment and instruments carried by New Horizons, the spacecraft also carries several artefacts, including a U.S. flag, and an ounce of Clyde Tombaugh’s ashes. He is the man who discovered Pluto in 1930. To reduce wear the spacecraft has spent much of its nine year journey in hibernation with checks to ensure the instruments still function and that it is on course. Because the spacecraft is so far from the Sun, it cannot rely on sunlight to power itself. Instead, its power supply comes from what is called a radioisotope thermal generator. Keep an eye on the Pluto Facts and Images pages for the latest updates from the new Horizons mission. Please bkeep me informed on all current News on Pluto & Kyper Belt. We need to wait 8 more years for this spacecraft to come back to earth. 9 dipending on how long it stays at pluto. I have a question thouhgh. Is it actually worth the wait for this spacecraft to come back to earth? I mean, 9 years is long. Hi am really interested in planets and where doing science at school to make a model and a poster keynote or powerpoints and aterfacts and it is so fun AND I LIKEt . So, 4ish hours to get radio reception from Pluto, but I lose phone reception constantly.